A compact design saves lab. space. These instruments are easy to maintain and service. 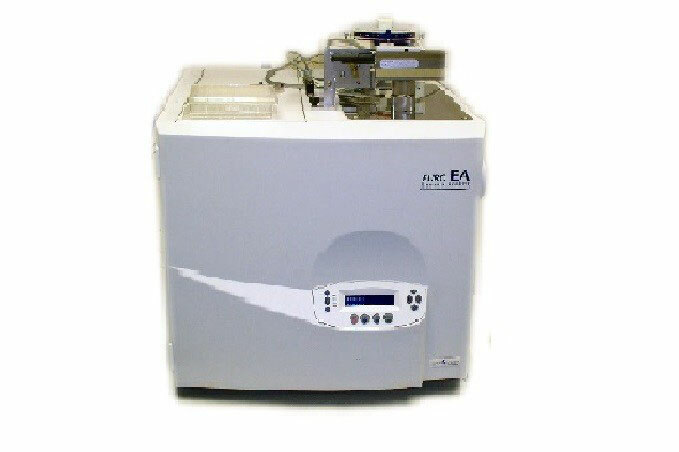 The Euro EA is a newly developed system for elemental analysis. The functional principle involves dynamic, spontaneous combustion with subsequent chromatographic separation. This principle has been used for 30 years and guarantees the best results. Specially tested analysers for soil, sediment, foodstuffs, protein analysis. Typical applications include org. and inorg. chemicals of any type, soil, plant material, sediments, glass fibre filters, foodstuffs and drinks, waste material, carbon and oil, tobacco, polymers and many more. The instruments may be reconfigured at low cost. By virtue of flexible tube diameter, programmable oxygen volume, selected catalysts etc. these analysers are suitable for a wide range of applications. Computer control software means the instruments are fully automated. Two sample dispensers for solids (small and large sample volumes) and two liquid sample dispensers are available. The data system lowers the oven temperature and gas flows after completion of the analysis series, starts analysis series at the programmed time or puts the instrument into operational stand-by mode. All instrument parameters are fully regulated by the data system. The required oxygen volume for the samples is regulated. Calibration of the the measured values is performed by factors, linier or non-linear functions. Automatic recording of the initial weight and maintence interval display ensure the highest standards of safety for the user.